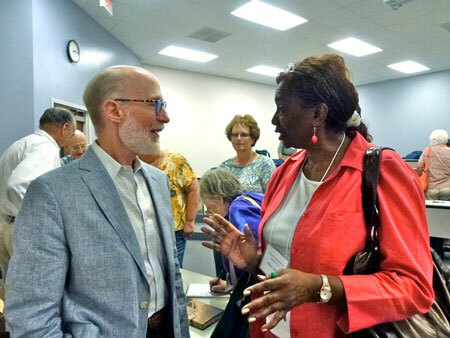 Leonard Todd, a presenter at the 2013 Southern Studies Showcase, talks with an attendees. 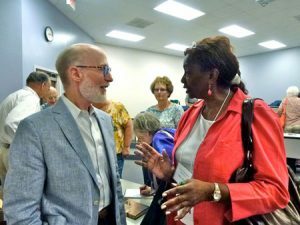 The Old Edgefield District Genealogical Society and Edgefield Civic League are hosting a “Southern Studies Showcase” in Edgefield on September 19 and 20, 2014. Genealogical and historical societies from all over South Carolina and parts of Georgia are being invited to participate in this two-day event. Last year the Showcase brought over 130 people from 11 states to the Town of Edgefield. This year it is expected to bring over 200 people. Twenty-four workshop classes will be held over the course of the two days, with local and out-of-town speakers giving lectures on a variety of topics (please see attached itinerary). Vendors from across the state will also set up tables with displays, and books and other items for sale. 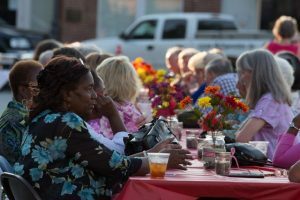 A “Block Party” on the Edgefield Courthouse Square will be held Friday evening from 6:30 p. m. to 8:30 p. m., including a catered Southern dinner and lively music. There will also be historical re-enactments from Edgefield’s colorful past. The theme for the “Block Party” is “How the 1920’s Roared During Prohibition.” Period dress is encouraged (but not required), and prizes will be awarded to the best period costumes. This two-day gathering will begin on Friday at 10:00 a. m., with speakers and workshops. On Saturday speakers and workshops will be held from 9:00 a. m. until 4:00 p. m. Time will be allotted on Friday and Saturday for lunch at local restaurants, shopping with local merchants, and visiting of local historic and tourist sites. The Registration fee for the Southern Studies Showcase is $30.00 and includes the “Block Party” Friday night. There will also be tours of Willowbrook Cemetery, a kiln opening by Old Edgefield Pottery, a special “lunch and tour” at Oakley Park on Saturday, and other special events scheduled during the Showcase to further highlight Edgefield. If you have any questions or concerns, please contact Tonya Browder at 803-637-4010 or OEDGS85@gmail.com. You can also visit the Old Edgefield District Genealogical Society’s web site at www.OEDGS.org for more details and a schedule for this exciting event.